HRL Motors has launched the new Zotye Z100 car in Pakistan in collaboration with the Zotey China. The Zotye Z100 is an affordable cars in Pakistani automobile market with outstanding features. 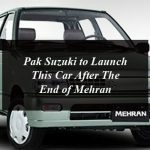 Look alike to the Mehran Alto the new Zotye Z100 car is a mid-range vehicle in the Pakistani automobile market and the standard version it equipped with 1.0 litre 3 cylinder engine, competent of producing 68hp, mated to a 5-speed manual or an ATM transmission. The Zotye Z100 is available having red, white, blue and silver color options. The official price of Zotye Z100 in Pakistan is Rs. 1,172,000. You can book Zotye Z100 in Pakistan at as low as PKR 25,000. United Bravo Booking Starts Now: Here is How You Can Book 800cc Car? How to Pre-order Corolla from Toyota Pakistan?